Right side view of the Mors SMG sole Polish survivor. 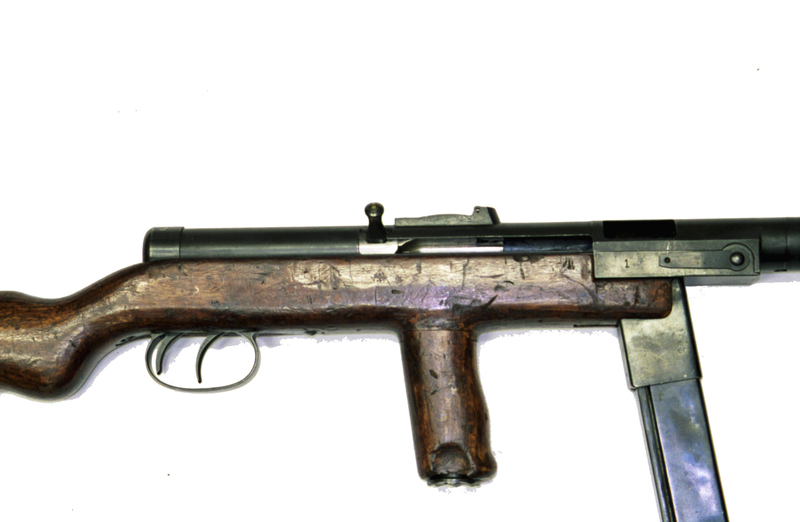 Many inventors were proposing the SMGs of their design to the Infantry Board of the modernizing Polish Army in the early 1930s. Of these, a project by Skrzypinski and Wilniewczyc, blowback operated selective-fire weapon with a quick-change barrel feature and vertically positioned magazine, was chosen for further development. Their project, when executed in metal and put to various tests, proved to suffer from excessive cyclic rate of fire (over 1200 rpm). Due to that, its 24 rd magazine capacity (governed by a size of the 9 mm military ammunition pack tailored to the Vis pistol ammunition allowance of three 8-round magazines) only lasted for a 1.25 sec of fire. With this excessive cyclic rate also came the excessive dispersion of hits. Nevertheless, the military testing board saw some merits in the weapon and recommended alterations to be made. 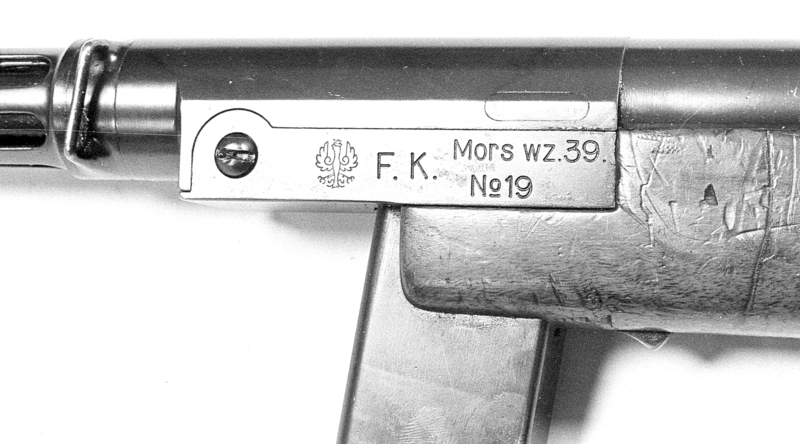 These were implemented by a team of young designers from Warsaw’s Państwowa Fabryka Karabinów (PFK, the State Rifle Factory), headed by Wilniewczyc and including Feliks Modzelewski, Jerzy Podsendkowski (later to create a revolutionary compact MCEM 2 submachine gun, that greatly influenced the design of the Uzi), Waclaw Dworzyński and Jan Potyński. 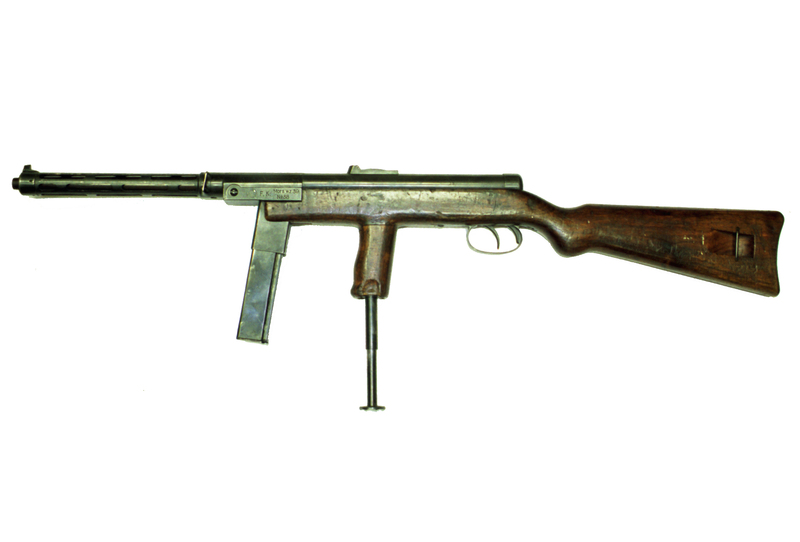 They were redesigning the weapon according to a new specification, basing on the results of the comparative tests of several European SMGs, staged by Instytut Techniczny Uzbrojenia (ITU, Ordnance Technological Institution) at the Infantry School in Rembertów, suburb of Poland’s capital Warsaw, during the spring of 1937. 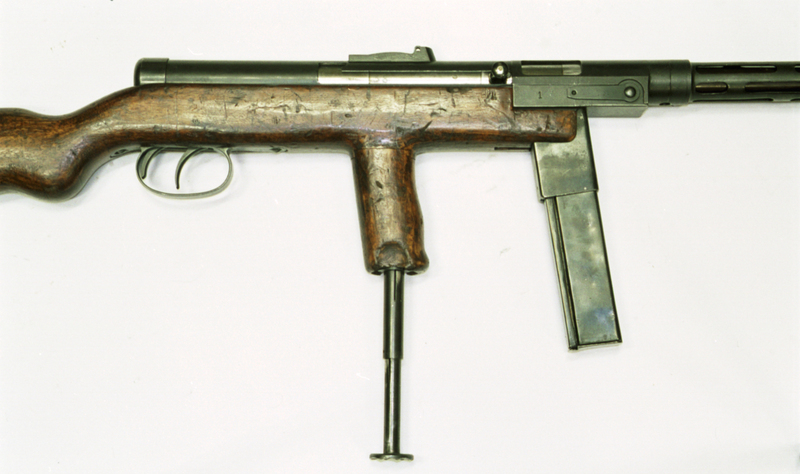 Among the SMGs tested to establish characteristics to be embodied in a new weapon were German Erma EMP, Finnish Suomi KP/31 (used by the Poland’s State Police since 1932), US Thompson M1921 (used by the State Police since 1926), and Swiss SIG-Neuhausen copy of the Schmeisser’s M.P.18,I. 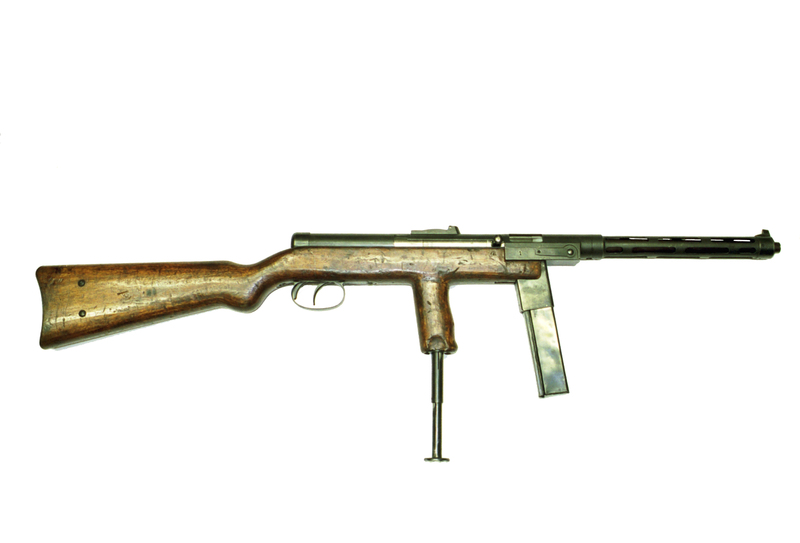 The Erma was found the most suitable for infantry use, with only the side-protruding magazine to blame. The second, improved prototype, and the first to be called Mors, was made at Warsaw’s PFK and put to tests at the Instytut Badań Balistycznych (IBBal, Ballistic Research Institute) in Zielonka near Warsaw. At the same time, in mid-February 1938, the design was patented (Nr 56 390) – but unfortunately, no copy of that patent survived the ravages of war. The only document dealing with this, and subsequent patent 61 051, pertaining to the pneumatic rate of fire reducer of April 14, 1939, is a patent rights purchase contract signed between the PWU-FK and the designers. Upon completion of the very thorough test program, a comparative test with the EMP was staged in April 1938. The test board found accuracy in both semiautomatic and full automatic fire ‘unacceptable’, blaming it on the barrel shorter than the EMP’s (210 mm compared to 320 mm). The initial velocity was 12 mps (36 fps) lower than the EMP. Test shooters complained about front sight blade being too wide and rectangular in section, contrary to the inverted V they were accustomed to. The sighting radius being shorter than the EMP’s, and loosely fitting quick-change barrel didn’t aided in accuracy, either. Cyclic rate of fire was lower than with the former prototype, but still deemed excessive at 750 rpm, compared to the EMP’s 520 rpm. 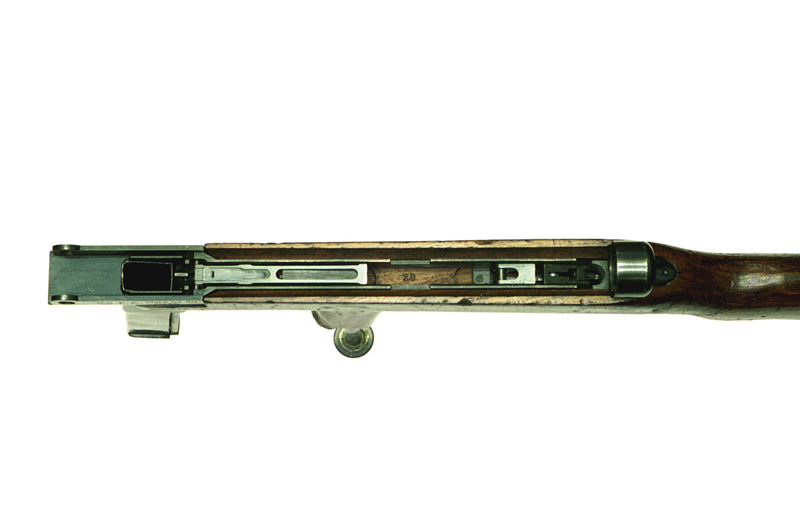 An “excessively stiff” return spring and “too short” (109 mm compared to 120 mm in the EMP) bolt travel were blamed for the high rate of fire. “Excessive length” of the stock and “wrong position of the foregrip”, were found guilty of weapon’s uncontrollability in full automatic fire. Placement of the foregrip, too far forward for the average shooter, was dictated by the magazine well being incorporated into it. It is an idea worthy of a note, as it came back with the Podsendkowski’s revolutionary MCEM 2 of 1944, where the magazine well was also incorporated into the grip – but this time it was the pistol grip, the only one that weapon had. Early short-barreled Mors prototype with magazine well inside the foregrip. The Mors test minutes were forwarded to the PFK and these resulted in the delivery of the two further improved variations (called ‘Model No 1’ and ‘Model No 2’) of the third, completely redesigned prototype, called the “Mors 2.” Nos. 1 & 2 differed in trigger mechanism, sight arrangement and magazine catch designs. Based on the comparative tests of the two, the No 1 model with a fire-selector lever was rejected, while the No 2 with dual triggers (influenced by the French Chatellerault 24/29 LMG, just like in the case of the contemporary Beretta M1938A) was to be further evaluated. The semiautomatic accuracy improved much, due to a longer (270 mm), more tightly fitted barrel and redesigned sights. The initial velocity was now barely equal to the EMP. A weaker mainspring coupled with increased bolt travel reduced the cyclic rate to about 600 rpm. The stock was redesigned, the fore-grip separated from the magazine-well and moved back, towards the center of balance, then drilled through and fitted with a Vollmer-style telescoping monopod. Nevertheless, the dispersion was still 40% higher than the EMP’s. It was much better than the former prototype, shooting 200 – 300% wider groups, but the dispersion in full automatic fire at a distance of 200 m was still 300% larger than that of the EMP. The vertical dispersion in burst fire was especially large, and ironically, grew even larger, when fired from the very monopod meant to stabilize it. The Board blamed it on still excessive rate of fire and lower, poorly balanced, weight of the weapon. The Mors 2 was indeed 690 g (1.5lb) lighter than the first Mors (3.95kg/8.7lb versus 4.64kg/10.2lb) and 520g (1.15lb) lighter than the EMP. The test minute recommended reduction of the cyclic rate to 500 rpm and increase in the weight of the weapon back to about 4.5kg (9.9lb), possibly by using a heavier barrel to both aid in controlling muzzle-climb and dissipate the heat. 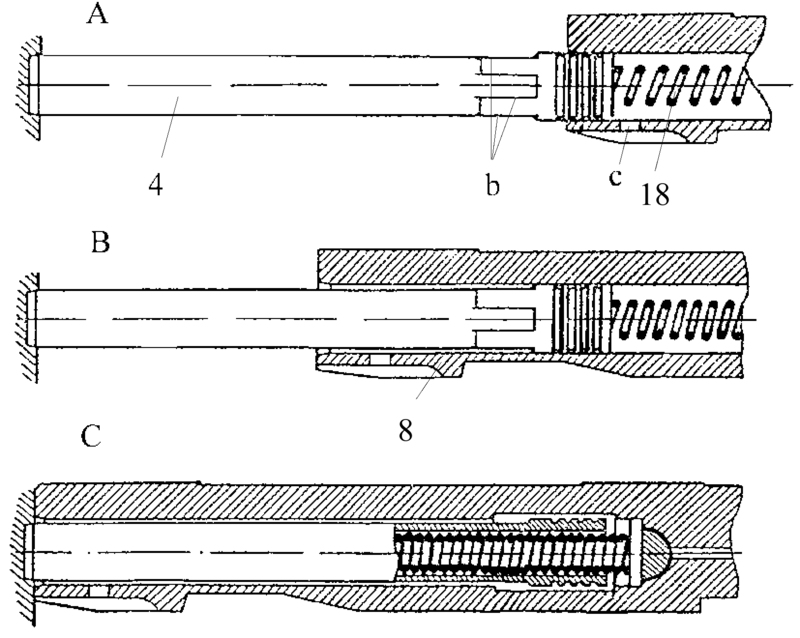 Barrel and bolt in their respective positions inside the receiver / barrel jacket. Massive barrel serves as a heat-sink for VERY intense firing. Who would ever shoot enough 9 mm rounds from it to make it hot enough to warrant changing? The all new, fourth prototype, called the Mors 3, embodied all of the above recommendations. A batch of three prototype sub-machine guns with three magazines each were ordered from the PFK with delivery scheduled for January 10, 1939. These were put to various tests. The rate of fire was recorded decreased to about 450 rpm due to the use of the pneumatic rate-reducer, slowing the bolt travel. The new gun was accepted by the Komitet Zakupów Uzbrojenia (KZU, the Ordnance Procurement Board) which placed an additional order with the PFK for a test lot of 36 units of the “9 mm pistolet maszynowy wz. 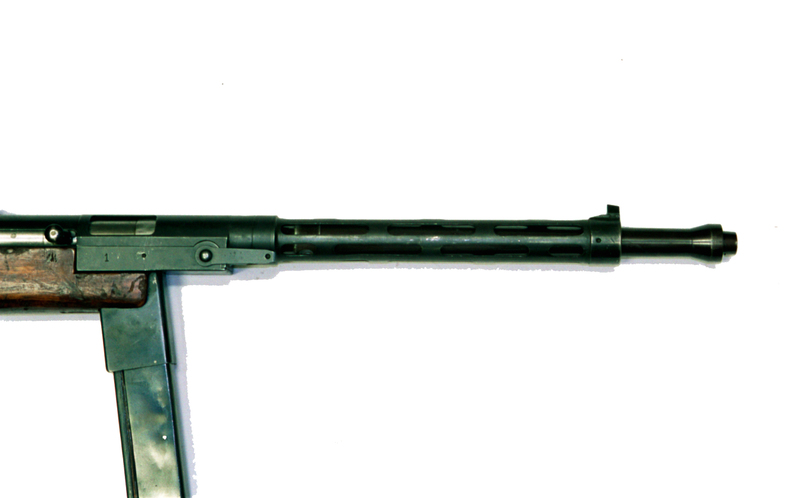 39 Mors” (or “9 mm M1939 Mors sub-machine gun”) for the troop trials. The delivery of guns, each priced at Zloty 2500 (then roughly $500), was scheduled for April 15, 1939, but actual delivery was postponed to June 3, 1939. The troop trials were conducted by 39th Infantry Division, Military Police units and the 3rd Rifles Battalion in Rembertow. The introduction of the Mors 3 was a major blow to the tankers. 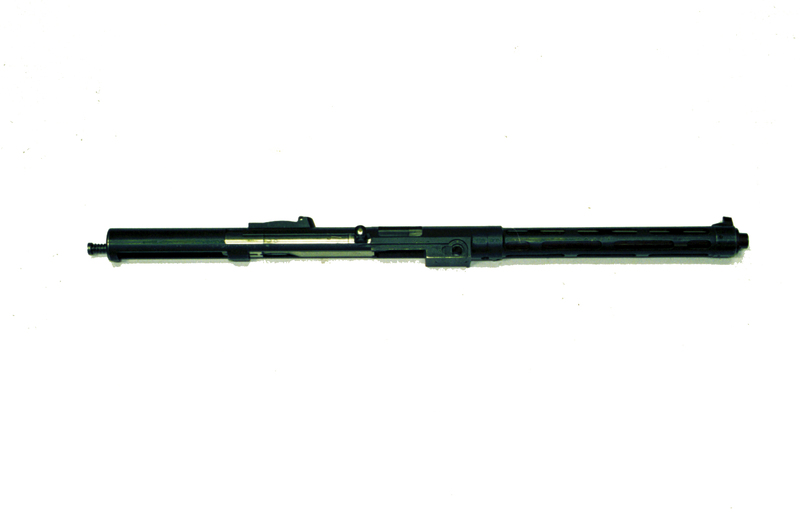 What begun two years earlier as a 828mm (32.6in) long SMG, now concluded in a 970mm (38.2in) weapon, only about an inch and a half shorter than the wz.29 Mauser rifle, long ago considered unsuitably long for tank crews use. They had to beat a hasty retreat to the stocked pistol idea. Vis wooden holster-stocks, that all the Vis pistols were cut for but which never before were issued, finally were designed in early 1939 but no hard evidence of their actual issue survived. In early 1990s Thomas B. Nelson of the Collectors’ Armoury Ltd. commissioned a batch of these to be reproduced in Poland, and reportedly got into much trouble with the BATF, not convinced that these were indeed replicas of the actually existing accessory. As the PFK has already tooled-up for serial production of the weapon, it is highly probable that it was continued during the siege of Warsaw, and several more Mors were made, presumably for the forces defending the capital. No any data is available however to support or to deny this hypothesis. For a long time after the war the Mors SMG remained half-legendary, esoteric weapon, that everybody in Poland heard of, mostly only in superlatives, but nobody knew about for sure. Much confusion was caused by Mr. Wilniewczyc’s own publication in Vol.1 (1959) of the ‘Muzealnictwo Wojskowe’ periodical issued by the Muzeum Wojska Polskiego (MWP, Polish Army Museum) in Warsaw. 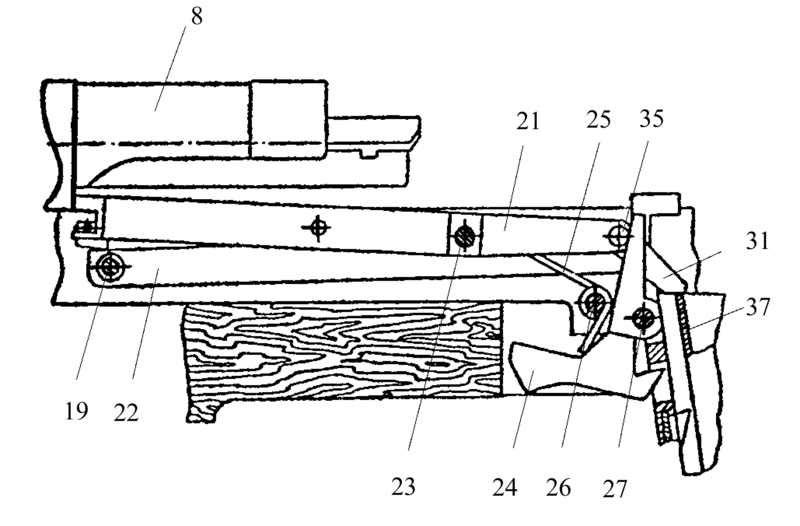 In the said publication the sketch of the original Mors with a short barrel and fore-grip encompassing the magazine-well, was published as an illustration of the production model, misleading many researchers. After Mr. Wilniewczyc have died of cancer in 1960, the nation-wide hunt for the Mors begun but it was only in 1983, when the first two were found in Moscow’s Central Red Army Museum. No any paperwork was preserved with them – the only records shown that these came to the Museum from the Red Army’s small arms research institution during the 1950s, together with about 100 other weapons. It is unknown whether these were captured by Soviets from the Polish or German troops. The two guns bore consecutive serial numbers – 38 and 39 – which suggests that these were taken from a warehouse rather than from the field troops. Also, the numbers tend to suggest that these were the last examples of the 36-gun batch ordered on top of the three Mors 3 prototypes. The s/n 38 Mors now on display in Warsaw’s Polish Army Museum is preserved in fair condition, except for a missing magazine, tangent sight leaf, broken trigger mechanism springs and a mock barrel, closely patterned after the barrel of the s/n 39 still in Moscow. A tapered muzzle with a perpendicular undercut suggests that some kind of muzzle-device was provided, but there is no trace of it in preserved records. A third example, s/n 19, was recently uncovered in the St.Petersburg Museum of the Artillery, Engineers and Communication Troops. Interestingly, although the serial number is 20 numbers apart from the Moscow ones, it also lacks the magazine and tangent sight’s leaf. The other interesting omission is the foregrip with the monopod. This missing item was found on…an 1950 experimental Kalashnikov AK-47, 1st Variant, pictured in the book ‘Kalashnikov Arms’ by Yuriy Natsavaladze and Boris Paranin, pp. 56-57! 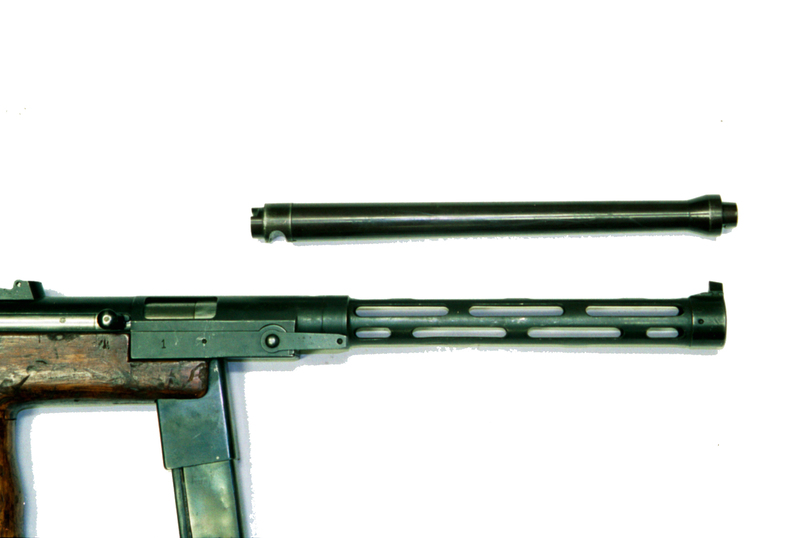 The Mors wz.39 was a blowback sub-machine gun, firing from the open breech, fitted with the dual-trigger firing mechanism, quick change barrel, hold-open device coupled with a lever automatically releasing the empty magazine from the catch, pneumatic rate of fire reducer, and telescoping monopod. No further bells and whistles, and this author found the lack of a little fountain particularly disappointing. Left side view of the Mors SMG with monopod extended. The monopod is placed at the unloaded gun’s center of gravity – it will stand on it without additional support. During firing it was reported to aid the muzzle jump – just like in the Vollmer’s Erma EMP, from which it was copied. The monopod itself consists of three sections, one of which is permanently attached to the gun and serves as an axis for the foregrip. The other two telescope one into another, and the one of the least diameter has a rounded foot at the bottom. This foot also aids in retracting the monopod from the foregrip. It’s a tough task, as the pieces of the monopod are fitted very tightly together. Five times out of six you’ll tear the whole thing out of its socket instead of extending it. With some training you’ll learn to pull only in short strokes – let go of it immediately after you feel it moved! Otherwise you’ll finish with movable parts of the monopod in one hand, and the gun in your other. It is also as tricky while shoving the damn thing back. You have to find the little tongues with projections on their ends, resting under the rim of the wider tubes, depress them to hide these projections and then push the inner part in until the next stop. Then locate another pair of tongues and repeat the process. After you try to do it once, even without the opportunity to fire the Mors with the monopod, you’ll have enough of that for a lifetime. Atypical for a weapon so full of gadgets and gimmicks, there are no safety devices other than the L-shaped cutout in the right rear part of the receiver. 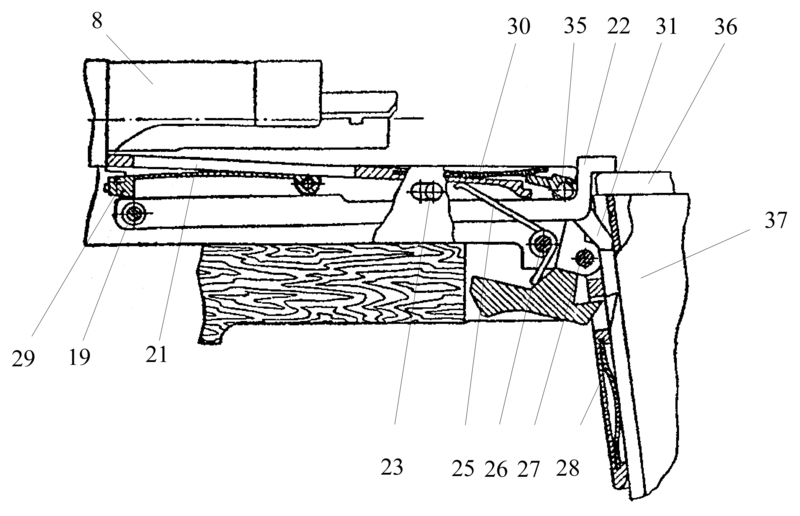 This at least works as in much other SMGs of the era – you have to retract the bolt past the sear and rotate the cocking handle into the slot, thus blocking it to the rear. 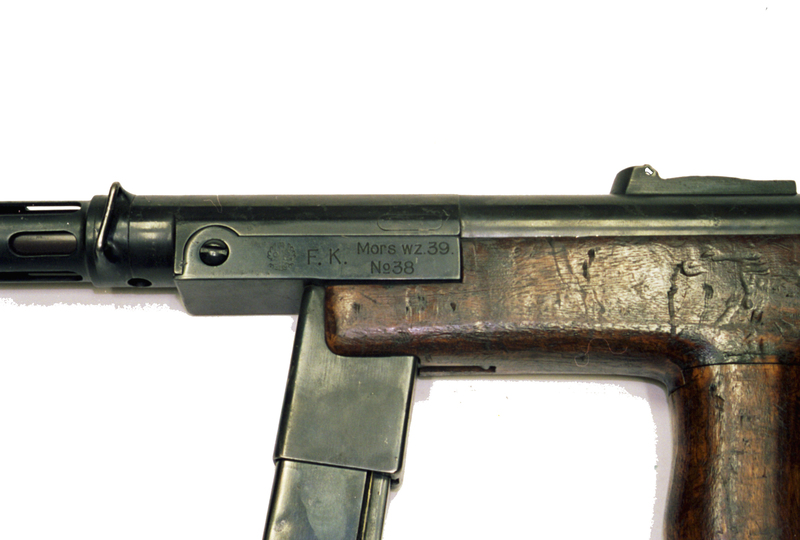 Cocking handle inserted into the safety cut-out of the receiver – the only safety feature of the SMG with all these bells and whistles! The trigger mechanism uses separate triggers for semiautomatic and full-auto fire. 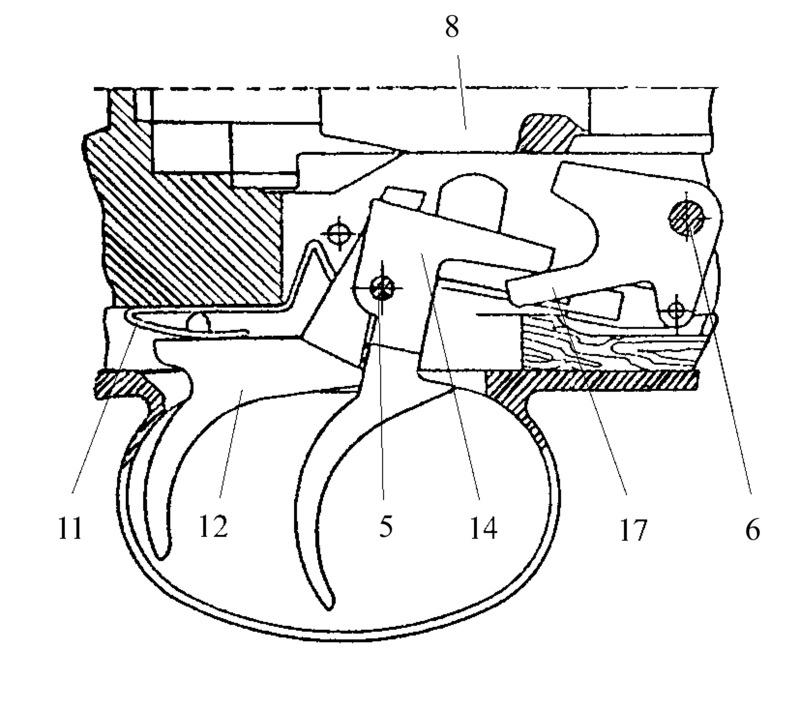 In the accompanying drawings the trigger spring  shape is hypothetical, as it is broken-off and only a stub of it survived. There should also be some kind of a sear spring, but this one is missing either. 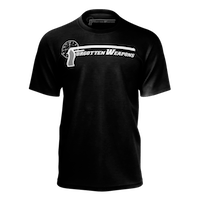 Pulling on the full automatic (forward) trigger lowers also the semiautomatic trigger, but the full automatic trigger remains in position when the semiautomatic trigger is being pulled. The disconnector  functions during the rearward travel of the bolt. The hold-open device incorporates as many as 10 (ten!) parts and is overly complicated even by then popular construction standards. Trigger mechanism operation – semi automatic fire. Trigger mechanism operation – full automatic fire. It operates as follows: The follower of the empty magazine raises the right arm of the lever , which in turn pushes the left arm of the hold-open  upwards. The bolt, traveling forward strikes the hold-open, pushing it about 3 mm forward, due to oval hold-open shaft openings in the walls of the trigger group housing. This movement pushes forward the auxiliary magazine catch , rotating on shaft . The shaft  in turn acts on the upper arm of the magazine catch , thus disengaging it from the magazine . By the way, this is about the only way to disengage the catch – it is flush with the stock and needs a narrow object being inserted into the opening to let the magazine go! The empty magazine cannot fall out freely, because it is held in the magazine well by both the auxiliary catch , actuated by the flat spring , and the flat magazine retaining spring , but it can be withdrawn without any further manipulation. 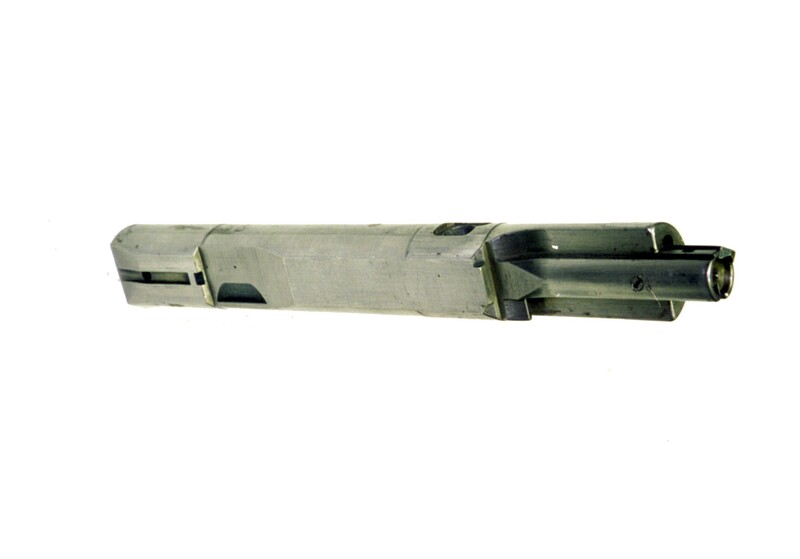 Removing the magazine will allow the auxiliary catch  to drop to a position in which the newly-inserted magazine will push it upwards thus raising the right arm of the hold-open. This will in turn disengage the left arm, allowing the bolt to go forward a few millimeters, until the sear engages, and the gun is ready to fire again. The magazine catch spring  will return all the parts to the battery. Pretty tricky, isn’t it? The pneumatic rate of fire reducer operating principle is also shown in the diagram. In extreme forward and rear positions the vents [b] and [c] will allow the air to bleed out, but during the movement of the parts those are sealed. During the forward travel a vacuum forms, and during the rearward stroke the air is compressed, in both cases slowing the action. Due to the non-shooting condition of the preserved gun one cannot establish how is this device really effective, but even while cycling it with a hand, one can hear the air hissing while being sucked in and blown. For the actual shooting results, we have to relay on the January, 1939 test minutes, claiming the rate of fire in the vicinity of 450 rpm. How would such a precisely machined device operate in real field conditions, we can only speculate. Rate-reducer. A – bolt fully home. B – bolt half way. 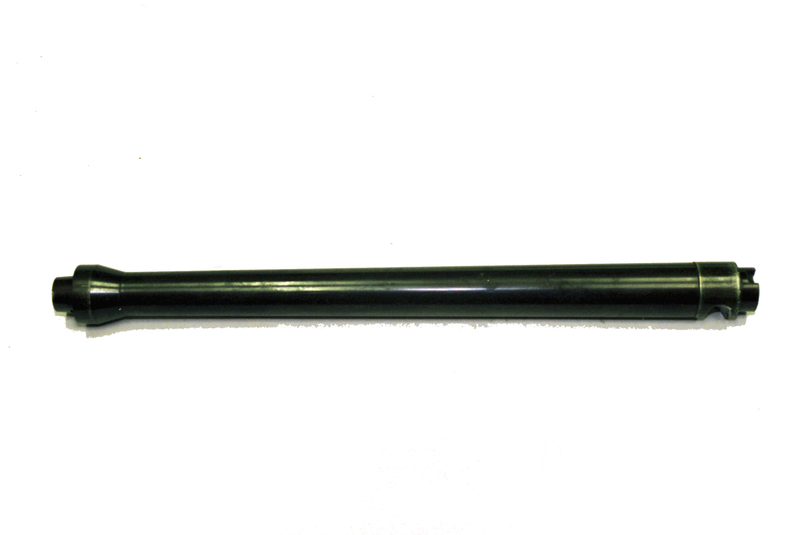 C – bolt fully rear. b – air vents in the piston. c – air bleeding hole in the bolt. The quick change barrel feature is one of the most doggedly discussed points of this gun. Ignoring the actual tactical virtues of the quick-change barrel design in a sub-machine gun (or rather, the lack thereof), the solution used in Mors is very far from ideal. In theory, all you have to do to remove the barrel, is to rotate the barrel change lever/disassembly pin clockwise through 180 degrees and point the barrel casing down. The heavy bull-barrel should drop out under its own weight. This author came to have some serious doubts about the good sense of the designers. In reality it still needs a hefty jerk of the weapon to disengage and fall. And you better watch your feet doing this stunt, as the barrel is heavy with sharp edges. I managed to punch a 2-3 mm deep mark in the heavy oaken floor boards of the museum’s warehouse, earning dirty looks from the otherwise very friendly museum staff! And this was with a cold barrel – what about a red-hot, heat-swollen one? Re-inserting is tricky, too. There is a narrow re-aligning post buried deep inside the barrel bushing, which you have to align with an equally narrow slit in the barrel. In theory that may sound OK, but then again in reality, the post is positioned so deep, and the slit is so short, that one can only pray to re-align the barrel properly with a first drop. If you miss it, the barrel sticks inside the casing, and suddenly all you have above the rim of the barrel jacket to catch onto and try to rotate it into position is a conical-shaped muzzle, roughly a centimeter of it. There are special openings in the bottom of the barrel jacket to assist in aligning the barrel – but they are of little use after dark. 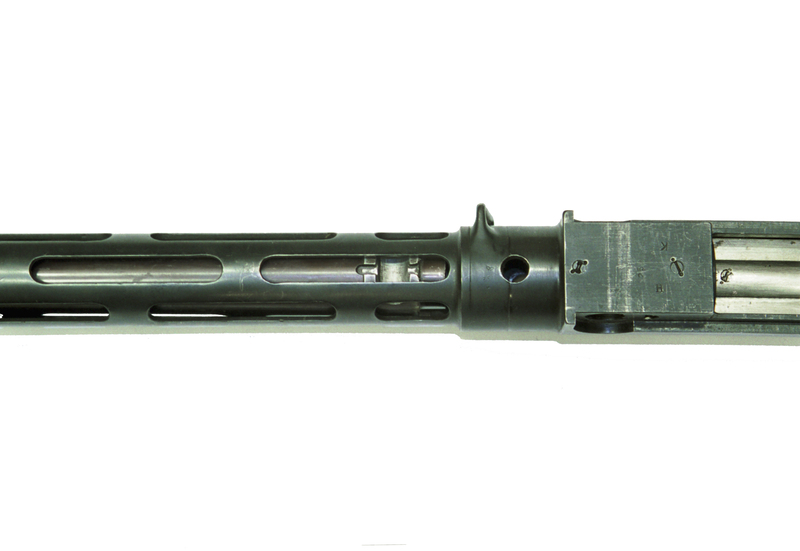 The whole barrel change process is a slow one and requires a lot of attention from the operator – a total “no-no” under actual combat condition. Thank God hardly any of these were actually issued prior to the September 1, 1939 German invasion! Barrel change feature in action: the barrel change lever is rotated thru 180 degrees to let the barrel loose, while holding the weapon still together, barrel partly withdrawn. While re-inserting barrel you’ll have to index it by aligning these two longitudinal lips with the bottom slit of the barrel jacket and with a circular hole underneath it. Sticking to that useless feature in the ultimate production model makes one wonder about the reason of the people who made this decision. For one, with the ammunition complement of three full magazines, or 72 rounds, it is impossible to render the thick, almost half a kilogram heavy bull barrel hot enough to require a change. The equipment list provides no magazine filler, so after shooting these three magazines, the shooter had to spend so much time loading them again, that the barrel would cool down completely by itself. Second, the barrel-changing procedure is so complicated, that no one would be able to perform it under the battlefield stress, in the dark. And finally, third – this is an open bolt weapon, bolt stays open between bursts, so even in the unlikely event of overheating the barrel, there would be no accidental discharges due to cook-off – so indeed, why bother? And they didn’t in fact – the June 1939 dated equipment list for the Mors shooter lists one pouch for three magazines with a carrying strap, one SMG carrying sling, cleaning kit, three magazines – and that’s it. No spare barrel pouch, no spare barrels. 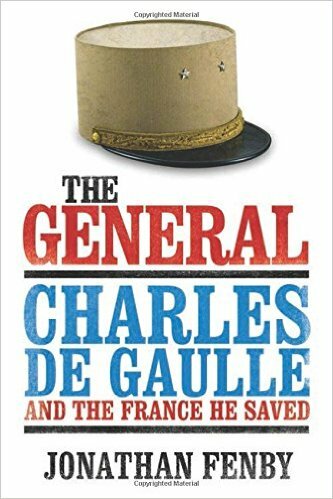 The reason (well, some semblance of it, considering reducing ready ammunition supply to mere three 24-rd magazines) had finally prevailed. On the other hand, the field stripping is very easy and straightforward – the barrel change lever  upon turning counter-clockwise through 90 degrees can be withdrawn completely, freeing the receiver from the stock. 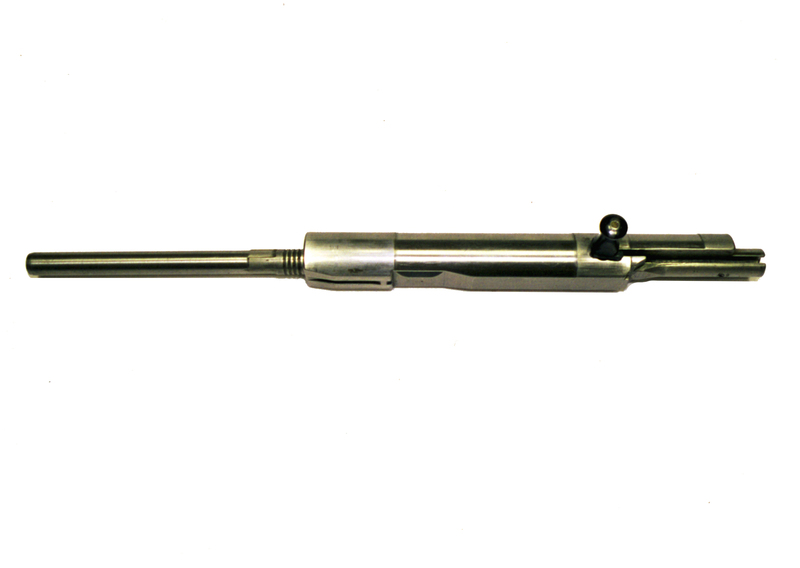 The barrel can be now drawn out, and bolt together with the return spring and rate-reducer tube would slide off the rear end of the receiver. The end of the return spring guiding rod fits into a cut-out in the rear of cocking handle, thus locking it inside the assembled bolt group. 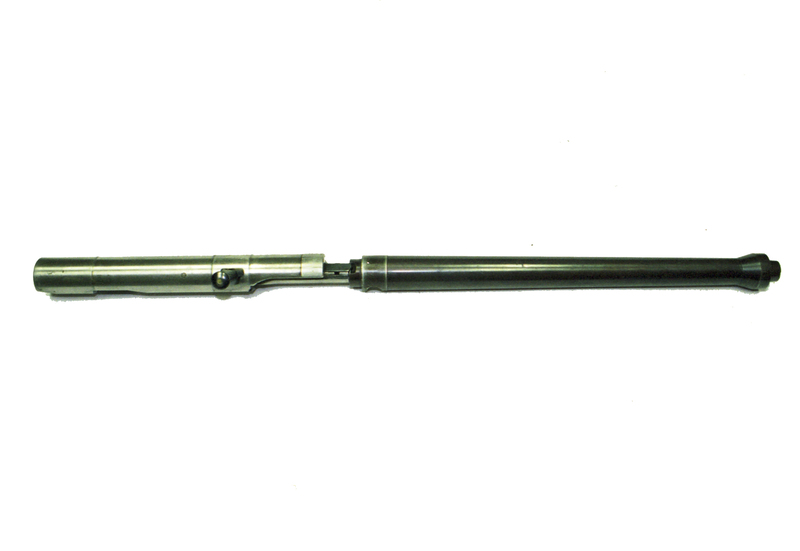 Upon withdrawing the mainspring group, the cocking handle is free to be taken off, thus freeing the bolt to be withdrawn from the receiver. Two screws secure the trigger housing to the stock. Further disassembly is neither recommended, nor needed, except for repairs. 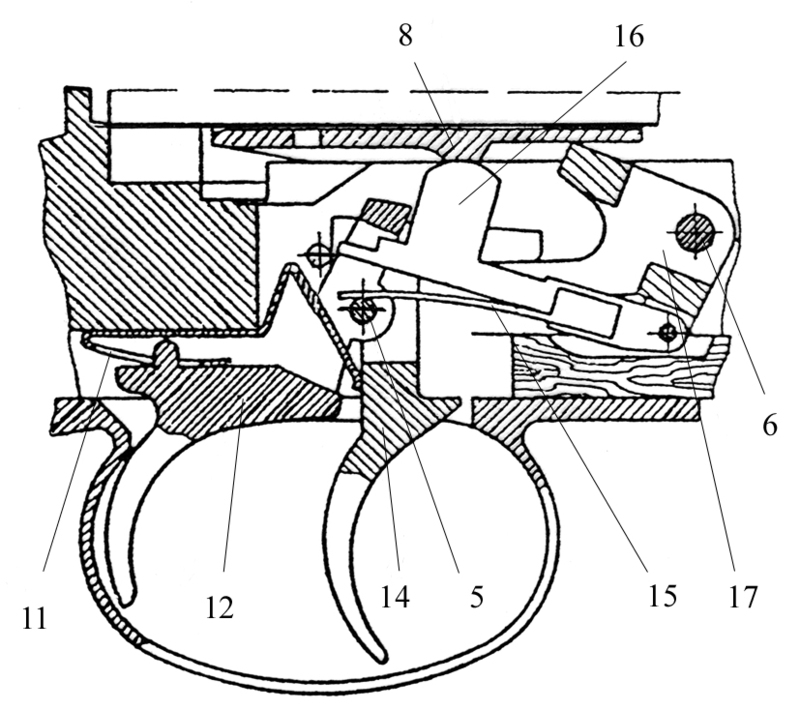 Cross section of 9 mm wz.39 Mors SMG (part numbers common for all other drawings): 1. stock; 2. trigger group housing; 3. receiver; 4. rate-reducer tube; 5. trigger axis; 6. sear axis; 7. rear sight base; 8. bolt; 9. cocking handle; 10. firing pin; 11. trigger spring; 12. semi automatic trigger; 13. trigger guard; 14. full automatic trigger; 15. disconnector; 16. disconnector spring; 17. sear; 18. mainspring; 19. hold-open lever axis; 20. telescoping monopod assembly; 21. bolt hold-open; 22. bolt hold-open lever; 23. hold open shaft; 24. magazine catch; 25. magazine catch spring; 26. magazine catch spring shaft; 27. magazine catch axis; 28. magazine retaining flat spring; 29. hold-open lever nose; 30. hold-open flat spring; 31. auxiliary magazine catch; 32. barrel change lever; 33. barrel; 34. barrel jacket; 35. auxiliary magazine catch axis; 36. magazine follower; 37. magazine body. Here are some photographs of Mors taken in Bydgoszcz. 1. The originally proposed name for the VIS pistol was WiS, combining the monograms of the two designers. The name VIS (pronounced in Polish in the same way as WiS) made it more universalistic. 2. Quick (?) 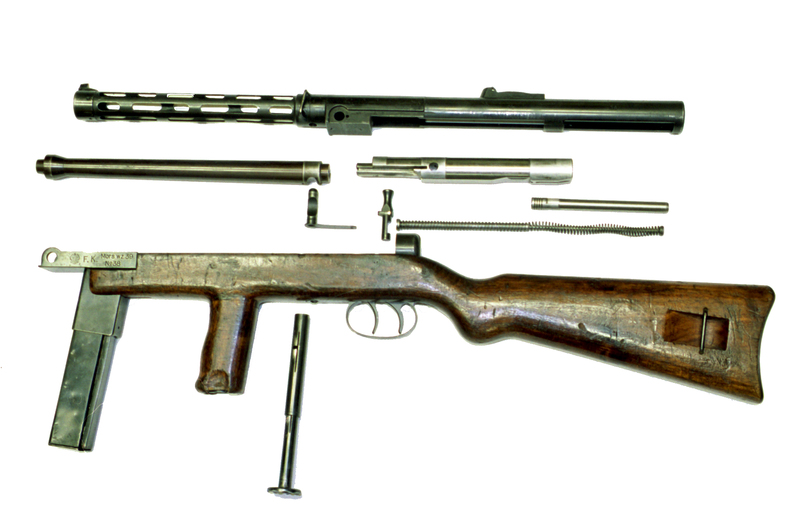 change barrel and monopod make some sense when we see them in the context of the epoch: the attempt to provide the full-automatic capability to the squad weapon (such was the Czechoslovak ZK construction for the Bulgarian Army (Hogg).